Translated from Der Brief des Jakobus, 11th rev. ed. prepared by H. Greeven. xxi, 285 pages ; 25 cm. Excursus: The prohibition against swearing. 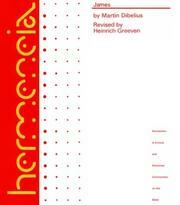 by Martin Dibelius ; revised by Heinrich Greeven ; translated by Michael A. Williams ; edited by Helmut Koester. Add tags for "James : a commentary on the Epistle of James". Be the first. bgn:translationOfWork <http://www.worldcat.org/title/-/oclc/2296210#CreativeWork/unidentifiedOriginalWork> ; # Brief des Jakobus. schema:about <http://experiment.worldcat.org/entity/work/data/4494927160#CreativeWork/bible> ; # Bible. schema:exampleOfWork <http://worldcat.org/entity/work/id/4494927160> ; # Brief des Jakobus. schema:hasPart <http://experiment.worldcat.org/entity/work/data/4494927160#CreativeWork/bible> ; # Bible. schema:isPartOf <http://experiment.worldcat.org/entity/work/data/4494927160#Series/hermeneia_a_critical_and_historical_commentary_on_the_bible> ; # Hermeneia--a critical and historical commentary on the Bible. <http://experiment.worldcat.org/entity/work/data/4494927160#Series/hermeneia_a_critical_and_historical_commentary_on_the_bible> # Hermeneia--a critical and historical commentary on the Bible. <http://worldcat.org/entity/work/id/4494927160> # Brief des Jakobus. <http://www.worldcat.org/title/-/oclc/2296210#CreativeWork/unidentifiedOriginalWork> # Brief des Jakobus.